The Republic of Ghana is located in West Africa and is bordered by Côte d'Ivoire (Ivory Coast) to the west, Burkina Faso to the north, Togo to the east, and the Gulf of Guinea to the south. Ghana has an area of 238,535 km2 (92,098 sq mi) and an estimated population in 2010 of 24,233,431. In 2009 the population was reportedly divided into the following groups: Christian 68.8%, Muslim 15.9%, Traditional African beliefs 8.5%. Trade with European states flourished after contact with the Portuguese in the 15th century, and the British established the Gold Coast Crown colony in 1874. The Gold Coast achieved independence from the United Kingdom in 1957, becoming the first sub-Saharan African nation to do so. The name Ghana was chosen for the new nation to reflect the ancient Empire of Ghana, which once extended throughout much of west Africa. The Ghana Mennonite Church was organized in 1964 under the leadership of S. J. Hostetler. In addition to establishing a church in Ghana, Mennonites have served the wider church in several areas of the country. The biggest thrust of this activity began in 1969 when missionaries could no longer serve in Nigeria because of the Biafra War (1967-1970). As a result some of them transferred to Ghana. Larry Borntrager, worked in the northern part of Ghana in an agricultural project operated by the Christian Service Committee of the Ghana Christian Council and the Presbyterian Church. From 1969 to 1982 12 young men served two-year periods in this program. The last one, Stanley Freyenberger, returned with his wife, Jane, and for six years managed one of the agricultural stations. In another area Edwin and Irene Weaver began relating to the sister churches in Accra of the Spiritual Independent churches (African Independent Churches) they had served in Nigeria. This resulted in the founding of a school called the Good News Training Institute (1971; now the Good News Theological College and Seminary), a day school for training church leaders in these churches. The school is controlled by a board of governors composed of persons from the various denominations of the city and by the Sponsoring Churches Association. Over the years the following Mennonite missionaries served these churches and the school: Willard Roth, Stanley and Delores Friesen, and Erma Grove. Several missionary doctors worked in hospitals operated by the Evangelical Presbyterian Church in the Volta Region. Assistance was also given to the following for short periods of time: Church World Service; Ghana Bible Society; Christian Messenger, a Christian newspaper; Christoffel-Blindenmission; Islam in Africa Project; Peace Corps; and in various teaching positions. Kraybill, Paul N., ed. Mennonite World Handbook: A Survey of Mennonite and Brethren in Christ Churches, 1978. Lombard, IL: Mennonite World Conference, 1978: 83. Mennonite World Handbook Supplement. Strasbourg, France, and Lombard, IL: Mennonite World Conference, 1984: 12. Wikipedia. "Ghana." Web. 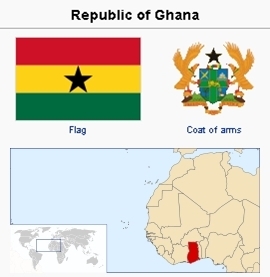 3 April 2011. http://en.wikipedia.org/wiki/Ghana. Grove, Erma and Richard D. Thiessen. "Ghana." Global Anabaptist Mennonite Encyclopedia Online. April 2011. Web. 22 Apr 2019. http://gameo.org/index.php?title=Ghana&oldid=121930. Grove, Erma and Richard D. Thiessen. (April 2011). Ghana. Global Anabaptist Mennonite Encyclopedia Online. Retrieved 22 April 2019, from http://gameo.org/index.php?title=Ghana&oldid=121930. Adapted by permission of Herald Press, Harrisonburg, Virginia, from Mennonite Encyclopedia, Vol. 5, p. 340. All rights reserved. This page was last modified on 7 May 2014, at 05:31.